The toolset provides a great basis for your non-profit association web site. The membership system in the toolset allows your members to maintain their own information and you can email them directly from the content management system allowing easy communication to your associations members. You can use the News Component to provide up to the minute information about the Association and can provide any number of Forums for your membership to discuss anything - and everything. 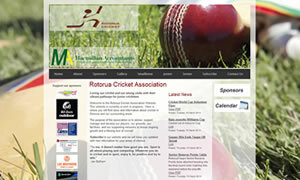 Need a new section on the site for a Special Interest Group...? No problem - simply use the Editor to create a new directory - add a password on that and it becomes Intranet for members use only. Upload files and have them available only to members in a special area - the downloadable reader for the file type is automatically placed next to the file. Need a central space for those photos of events - the toolset provides you with the ability to upload any number of images to your association web site. Harbour Golf covers all areas in the northern part of the Auckland District, from Waitakere to South Head across to Omaha, Great Barrier and down to Devonport and all points in between. Auckland Golf Association. 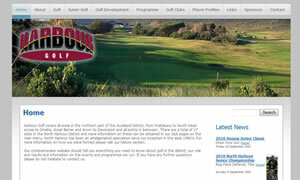 This website is two in one with Mens Golf and Womens Golf in one site. 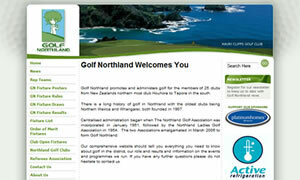 Golf Northland is the most northern golf association in New Zealand. Horsham Downs Golf Club is set in between the Waikato River and River Road in Hamilton lies an unexpected gem for golf lovers. Only 3km from Flagstaff in the northern suburbs. 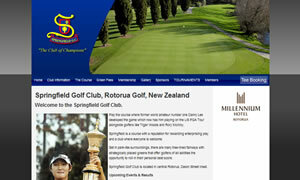 One of New Zealand's strongest golf clubs. Winner of three straight national titles.